The Starbucks on the corner of 6th and Union in downtown Seattle had a very special guest barista today: Seahawks player Luke Willson (#82) spent an hour at the drink hand-off plane, working hard to bring smiles to customers’ faces! And I watched, and everyone left with a huge smile on their face. The Seahawks football player was one of 8 players participating in this event to raise awareness and donations for the non-profit A Better Seattle, created by Seahawks coach Pete Carroll. 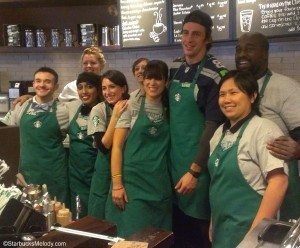 The Seahawks players were spread out in a variety of Starbucks stores all over Seattle (and nearby Renton as well), and all worked for a full hour, from 3:00 p.m. to 4:00 p.m. today (October 23, 2013). The official Seahawks article on this event is here. 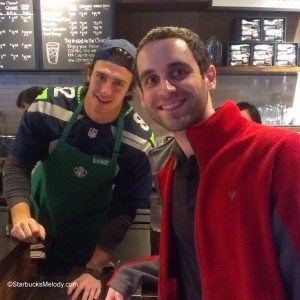 I dropped by the 6th and Union Starbucks right at 3:00 p.m. today, and pretty much had a blast watching all the smiles, and surprised faces to get a drink from a Seahawks player. 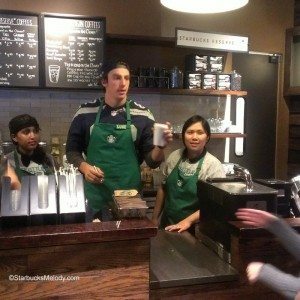 It was clear that some customers just dropped by to get a drink and wasn’t expecting a football player to be handing them their drink! Every drink came with a sleeve personally autographed by Luke Willson! As Luke handed off drinks, store manager Chanel (on the right) was always nearby. Sarah and Chanel nearly look like ready bodyguards for Luke! 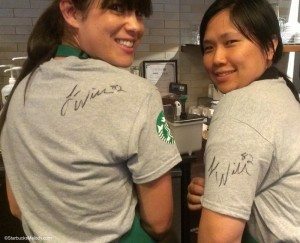 Two of the store’s partners ended up with their shirts specially autographed for them. (On the right is store manager, Chanel). They both look very happy! 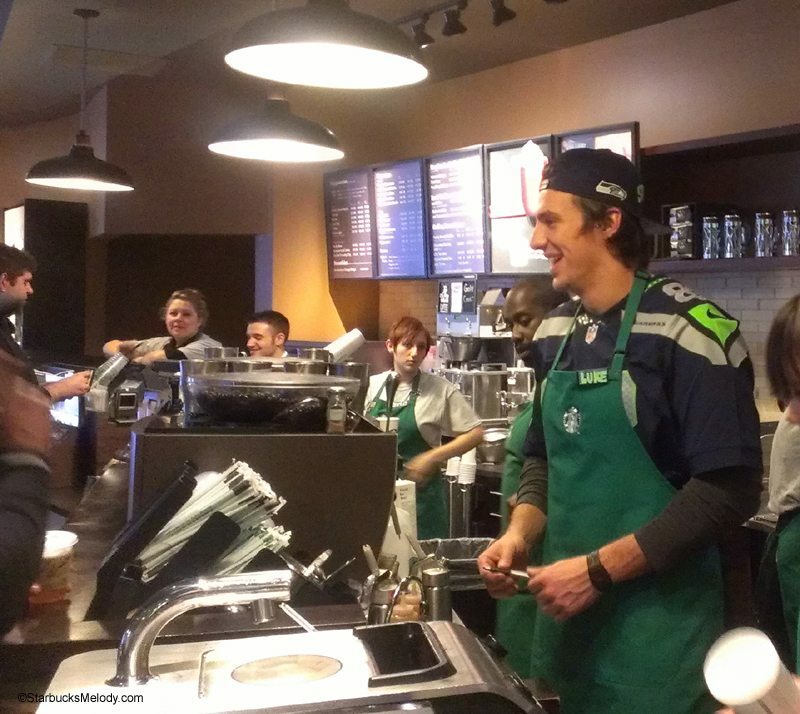 At one point, a shift supervisor from the nearby Fourth and Union Starbucks dropped by, while on a break. 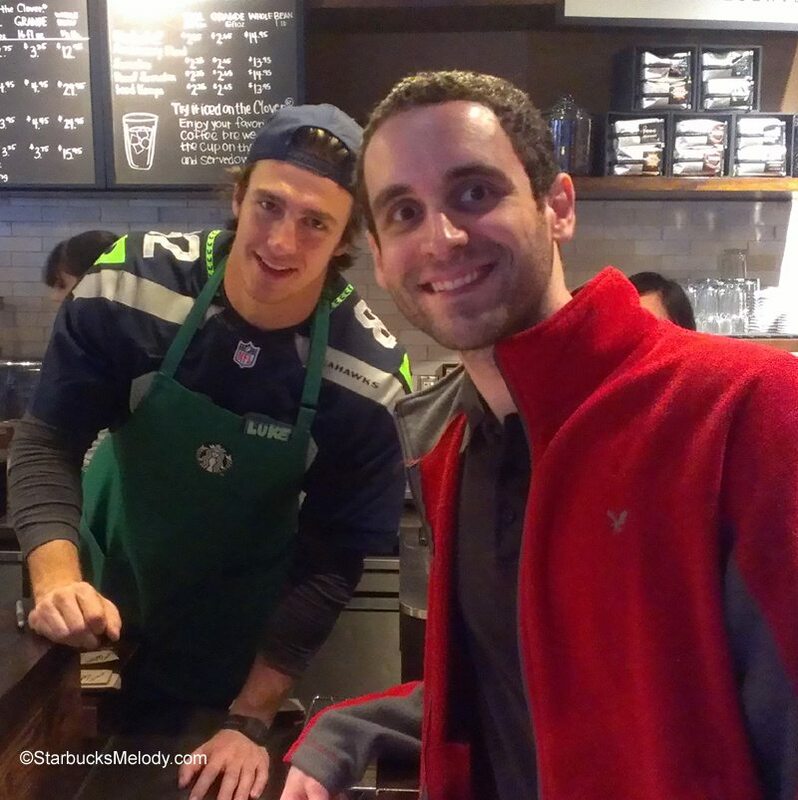 Aaron told me that he’s a huge Seahawks fan, and so I had the chance to snap a posed shot of Luke Willson with Aaron. I think this made Aaron’s day too! The hour went by super fast. It was such a unique event, that I definitely wanted to share it with you. 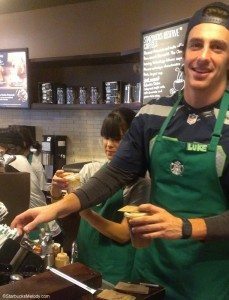 I can only imagine the total surprise when an unsuspecting customer gets a beverage from a dreamy football player in a green apron. Good Morning Starbucks Reserve Roastery and Tasting Room. This is indeed very cool. Coach Carroll was terrific in L.A. with his charitable endeavors, even after he left USC. I believe a lot of good work is around the corner, thanks to his and Starbucks’ partnership. Did it seem as if people were donating much? I am not holding my breath that Starbucks PR will comment about it again next week. I do not follow this team so do not know this player, but what a nice way to get customers involved in a good cause! SB should reach out to local teams in all their regions and see if there are nonprofits or charities that would benefit from such an event. I too would be curious if there were any donations. That is too cool! I wish I could have been there to get a photo with him! 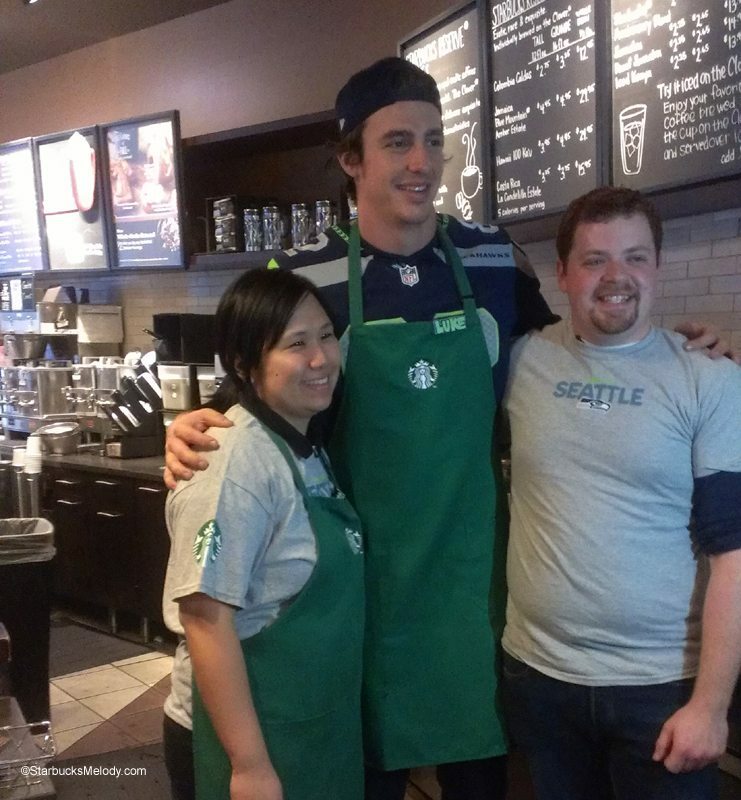 Good thing this wasn’t a Minnesota Viking, they would have dropped my coffee over and over, then given themselves a concussion tripping and falling into the counter. Also, good stunting, but if I was grumpy and tried and random celeb (who isn’t going to be a very polished barista) was making my drink, I’d probably be really annoyed! I’m glad you guys liked the pics! Al Iverson, there were no fumbles with the beverages! This is great! Would love it if all cities with teams would do this. I know I’d pack up my daycare kids to have a field trip to Starbucks if we’d get that opportunity here. Al Iverson, your comments are too funny! @BeckyE – I bet three are kids who would love this! Too bad there were no kids around. 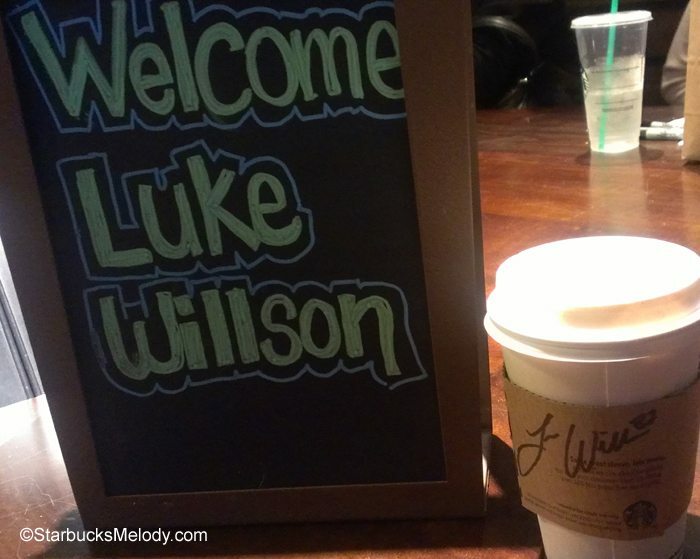 The Starbucks I usually go to have a very tiny percentage of customers who are not adults. @Hayley – Thanks my friend! I hope Starbucks does something like this again. Great to see the players involved. Melody, you had indicated that the 3 for 2 coffee bean promotion maybe back in the Fall. Any word on exact date if it is coming back?